Press TV – The European Union (EU) and South Korea have jointly underscored the importance of the 2015 nuclear deal between Iran and six other countries. 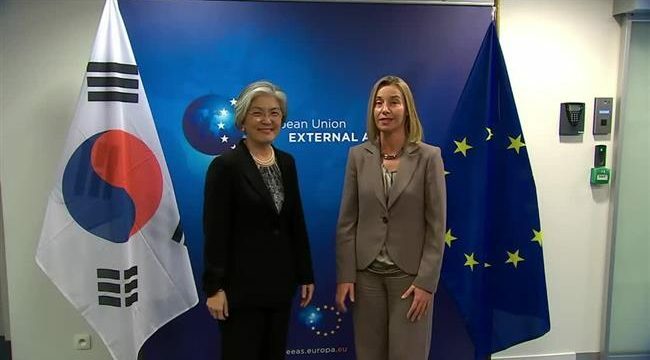 The EU’s foreign policy director, Federica Mogherini, and South Korea’s Foreign Minister Kang Kyung-wha stressed the significance of the deal during a meeting in Brussels on Friday. They “acknowledged its (the agreement’s) importance to the international nuclear non-proliferation regime,” the EU reported on its official website. The agreement, officially known as the Joint Comprehensive Plan of Action (JCPOA), terminated nuclear-related sanctions against Iran in return for a number of limits to the Iranian nuclear program. The deal was reached between Iran, Russia, China, Germany, the United States, the United Kingdom, and France. But the administration of US President Donald Trump, who took office a year after the deal began being implemented, has been opposed to the agreement. On October 13, he said he would not be certifying Iranian compliance with the deal under a domestic American law, a move that could potentially impact the deal’s standing. But the rest of the parties to the deal have hailed it as a diplomatic triumph and said it should be sustained. So have the entire 28 members of the EU. Separately, British Prime Minister Theresa May repeated London’s commitment to the JCPOA. French President Emmanuel Macron also spoke after the plenum, noting that the EU would continue to honor the agreement. “We cooperate with the US so they are persuaded considering the necessity of the agreement,” he said.